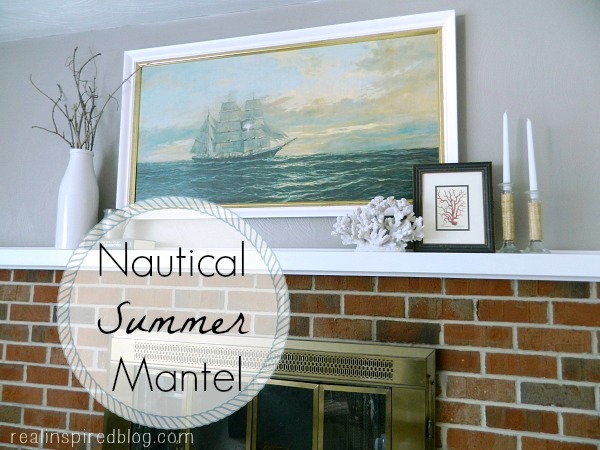 Since tomorrow is the first day of summer, it just seemed right to show you all my nautical summer mantel. Actually, it might just turn into my all-the-time mantel! And it all started with some super cheapo, thrifted art. I love the beachy feel and I love being out on the water. There's not much better for a hot, southern summer day than lazing around in a pontoon on the lake and catching some fish. Or renting a beach house on the ocean for a week...it just makes me relaxed thinking about it. The smell of sunscreen, midnight walks on the beach just because you can, sand everywhere, and just the whole casual atmosphere is wonderful! I am thinking that living near the coast makes it acceptable for me to decorate our place like a beach house. I want to evoke that relaxed feeling everyday! 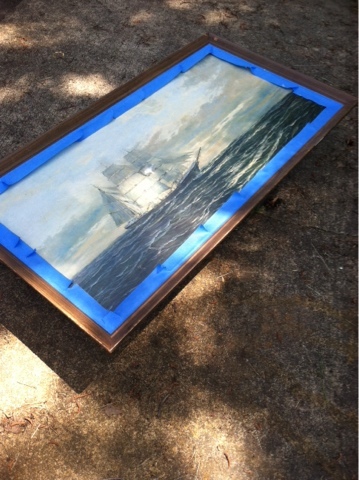 This ship "painting" that I picked up at the thrift store really isn't one. The frame isn't exactly a real frame either. The whole thing is basically cardboard. I could pick it up and chunk it somewhere pretty easily. I managed to get it for a little over $3, which is great because it's really not worth more than that! There was some damage to the picture and the frame where a sticker or something had pulled off the top layer of cardboard/paper/whatever-this-is-made-of. The best cure for that is paint of course! The part I really liked was the area around the picture that was gold and something that looks kinda like grasscloth or burlap. I wanted to keep that part showing so I taped it off. I gave the frame a coat of primer and 3 coats of white paint, leftover from the boys' room. Now it's gone all cottage chic on me! To create my mantel, I did what I always do: shop the house. It took me a week or so to finally get it here. I kept changing it and then leaving it for a few days to see what I thought. I've decided that this is the end result simply because I'm tired of redoing it. Honest confessions found here! I do think that the end result is a very beach cottage feel. And I love that. 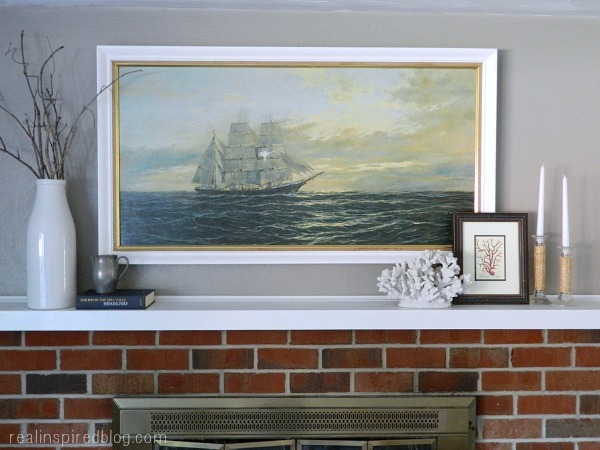 Come back next week and I'll show you the entire nautical summer living room! 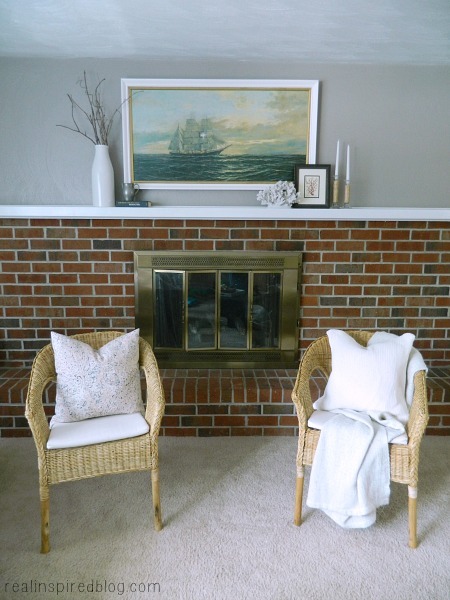 I love the beachy feel of your mantel Elizabeth! We are nowhere near the beach here in CO but I am thinking I need to add some of that mood into my decor for the summer too! Thanks Kathe! I think all homes need a touch of the beach somewhere! I love what you did with the painting. It's amazing, personal touch goes a long way. It definitely looks lovely with all your decorations. It truly gives a beachy feel.